Mumbai: On November 21, 2018, close to 80 women widowed by farmer suicides across Maharashtra gathered at the Azad Maidan grounds in south Mumbai with one demand: That the government acknowledge their existence as women farmers with rights to the land that they had once tilled with their husbands. 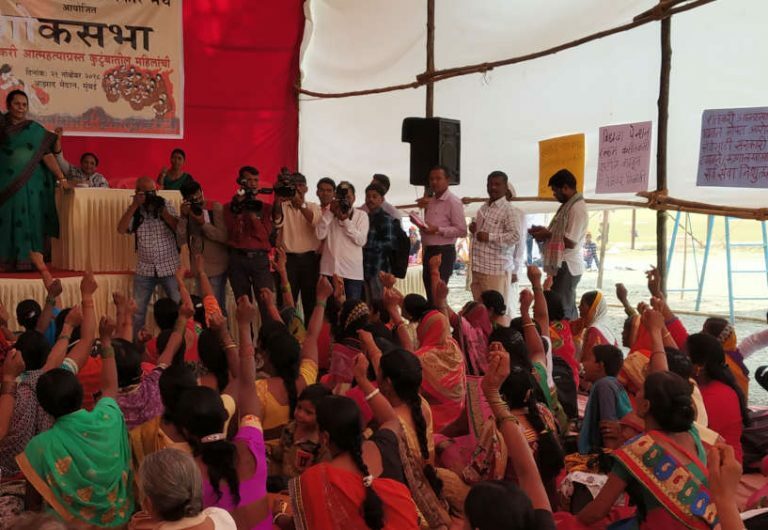 Protesting women farmers from across Maharashtra gathered at Mumbai’s Azad Maidan on November 21 to demand their rights from the government, at a rally organised by the Mahila Kisan Adhikar Manch (MAKAAM). Seen on stage is Shiv Sena member of the legislative council in Maharashtra, Neelam Gorhe, who also participated in the meeting. 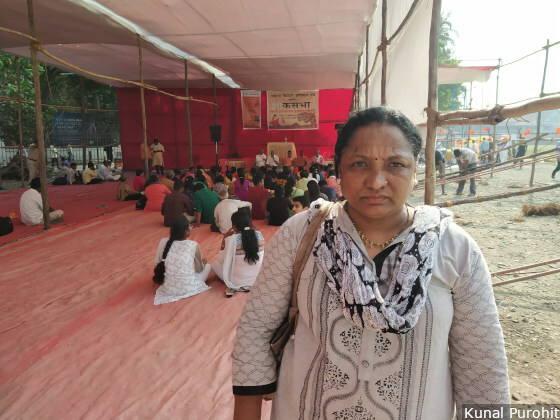 Anitatai, whose husband had killed himself five years ago because he could not pay off mounting debts, travelled 400 km from Osmanabad in central Maharashtra to join the protest here. When she was widowed, her in-laws refused to give her a share of the family land and threw her out of the house as well. When Anitatai went to buy subsidised grains through the public distribution system, the shopkeeper refused. “The rules say you must have an independent ration card,” he told her. But her in-laws had not allowed her to get herself an independent ration card as long as she was married. Did she have any farmland in her name to establish her identity as per rules? the shopkeeper asked. “Would I need your ration if I had land in my name?” she had retorted. Anitatai had to return home without rations. 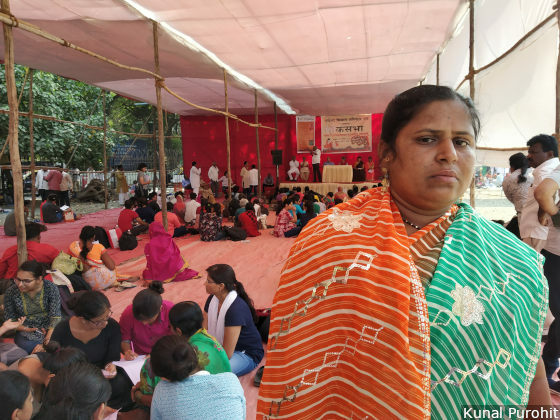 There is no social or government safety net to protect the interests of Anitatai or any of the women gathered at the Mumbai rally, all with similar stories to tell. They are ostracised by society and often held responsible for the deaths of their husbands, said the women. Over the last two decades, the drought-prone Marathwada and Vidarbha districts in Maharashtra has seen over 62,000 farmer suicides. The crisis was brought on by repeated crop failure, poor remuneration, growing debt, frequent droughts as well as pest attacks on standing crops. Forty percent of women widowed by these suicides between 2012 and 2018 were yet to get rights to the farmland they had cultivated with their husbands, according to a study conducted by Mahila Kisan Adhikar Manch (MAKAAM), an umbrella body of organisations working for women farmers. And only 35% of them secured the rights to the family house. The study released on November 21, 2018, on the sidelines of the rally, surveyed the lives of 505 women farmers whose husbands had committed suicide due to agrarian distress. It covered 11 districts across Marathwada and Vidarbha, the regions most affected by agricultural distress in Maharashtra. Without any security net and with limited access to government benefits, women are likely to be driven deeper into the circle of debt and penury, said activists. The survey and its results showed that there is little reference in government policy to the struggles of these widowed farmers, said Seema Kulkarni, a member of MAKAAM’s national facilitation team. Since the government’s conversation with these women begins and ends after the suicide of the male farmer, MAKAAM wants to push for more gender-sensitive policy making, she said. “Women are never recognised as farmers,” she said. “The truth is that they are farming alongside their husbands and continue to do so even after their husbands die.” Existing policies only recognise these women as farm labour, she added. All this means that it becomes very tough for women to re-enter agriculture after the death of their husbands. Maharashtra’s social security systems have been criticised for their fragility: In recent years, the state has been cutting down its spending on crucial social welfare schemes. The situation is compounded by the lack of awareness among beneficiaries. For instance, 41% of the women interviewed for the survey either don’t have a ration card or are listed only in the family’s ration card. The reason is that 63% of them don’t know that they were entitled to an independent ration card. There is a Rs-600 pension offered through the Sanjay Gandhi Niradhar Yojana, a state scheme for vulnerable sections of women, such as widows and those abandoned, orphans and disabled persons. Even that pension money got through to only 34% of women surveyed and even fewer got it every month. Around 33% did not even know about the existence of such a pension and had not applied for it. Madhuri Bhoge, 45, from Karanji Bhoge village in Wardha used to be a farmer but switched to working as a tour guide at the Gandhi Sevagram Ashram in Wardha after her husband hanged himself at the family farm in 2007. The government pays an ex-gratia sum of Rs 1 lakh to women who are widowed under such circumstances but Bhoge did not know about the scheme. Madhuri Bhoge, 45, from Wardha’s Karanji Bhoge village, lost her husband in 2007, after he hanged himself from a mango tree in their farm. The family owed lenders over Rs 1.5 lakh after their crops failed repeatedly. Bhoge’s husband, Omprakash, developed mental health issues due to this debt. When he committed suicide, the government denied that it was due to agrarian reasons. As a result, Bhoge never received the government’s ex-gratia payment of Rs 1 lakh for all homes which saw a farmer’s suicide. She was thrown out her home by her in-laws. “They blamed me for his death. In our villages, families often do that--when farmers commit suicide, they blame the wives for it,” she said. It was only now, 11 years later, that Bhoge realised that she could have had access to money that could have helped her tide over the crisis. There was another problem. Her husband had “mental health” issues at the time of his death; Madhuri attributes this to the stress of repaying a loan of Rs 20,000 that had compounded to over Rs 1.5 lakh after three bad harvests. “Government officials refused to categorise it as (farm-related) suicide because they said his records show he was mentally ill,” said Bhoge. “Rules prevented us from getting the help that we needed then.” But she fought back and refused to leave the family home till she and her children were given their share in the farm. Maharashtra’s fiscal priorities--it has made cuts in social spending--could have compounded the distress of farmer widows, the report suggested. The lack of affordable healthcare, for instance, has meant that families have to borrow to fund medical expenses, increasing their existing loan burden. Here is what the study showed: Of the 69 families surveyed who needed to fund medical procedures, 47 had to take a loan to meet the expenses. This is despite the Rs 1.5 lakh offered by the Maharashtra government as health cover through its flagship health insurance scheme, Mahatma Phule Jan Arogya Yojana. Only 19% of those surveyed knew about this scheme. Lack of awareness about the scheme and the resultant poor access for families also coincided with a decline in the government’s motivation to keep the scheme functional: The Maharashtra government announced a 56% cut in the funding for the scheme in 2018. In 2016, Savita Shelke, 33, of Osmanabad’s Baula village, was dispossessed of her home and property after her husband, depressed by repeated crop failure, killed himself by consuming petrol. “He never told me how much debt there was, but I knew the lenders had been troubling him,” she recalled. Harassed by his family, she migrated to Pune city, where she works as a domestic help. Savita Shelke, 33, lived in Osmanabad’s Baula village and farmed with her husband till 2016, when he consumed petrol to end his life after rising debts. Her in-laws mistreated her, she says, forcing her to relinquish her rights to the farmland and family house. She now lives in Pune, where she works as a domestic maid. However, her two children’s education costs consume 40% of her income and she struggles to meet all her expenses. Shelke earns around Rs 72,000 a year but the annual cost of educating her two children comes to around Rs 30,000, leaving her little to cover rent and other expenses. “The family did not help me at all, but can the government not do anything to at least ensure my children’s education?” she said.